RCB finally got themselves their first win of the ongoing Indian Premier League season beating KXIP in Mohali. 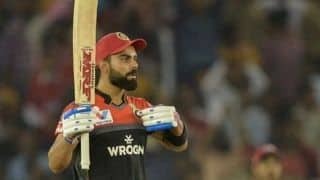 Half-centuries from captain Virat Kohli and AB de Villiers overshadowed Chris Gayle’s unbeaten 99 as Royal Challengers finally snapped a six-match losing streak this IPL season with an eight-wicket win over Kings XI Punjab in the Indian Premier League. 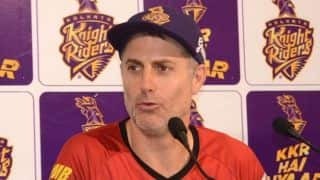 It was the 85-run stand between Kohli and de Villers before the South African got involved in a match-winning 46-run partnership with Marcus Stoinis which handed RCB a much needed win. 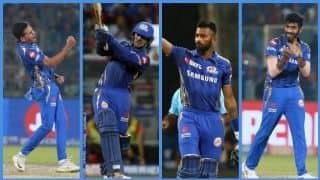 Defending 174, KXIP bowlers not only failed in getting wickets but also leaked runs as the visitors crossed the line with four balls to spare. 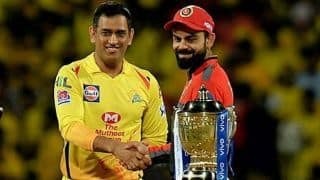 Kohli, who has been recently criticised a lot for not leading Bangalore decently, however took charge of the chase and led from the front with de Villers to help his side cross the 100-run mark in 11.1 overs. The Bangalore skipper meanwhile, also notched up his half-century off 37 balls.